Mmmmm. Pork fat. Seafood in pork fat. Sounds simultaneously sinful and healthy! Smoke lard AFAIK has a higher smoke point than any vegetable oil and is high in vitamin D as well. As long as you fry food at a high enough temperature the food shouldn’t come out greasy. Reminds me of Purico. Anybody remember Purico from a million ages ago? woohoo! i think i’m kinda Vitamin D-deficient….. I must say, that looks so delicious… all that transfat! Ay kalami ! Which bakery supplies store did you go to, MM? MM, We must have just missed each other at Ong Kin King today. Gosh, that place is amazing and full of surprises. Been buying my supplies there since 2007 and never bothered to ask if they had pork lard. Have gone thru their newly opened “retail” space beside only once and noticed that they charge a bit more for the items. Must be for the ambiance….hehehehe ;-> . Anyway, I’ll ask my suki salesgirls next time i dropped by the bodega store. Looks like I was there ahead of you. Purico, of course—who can forget that…i remotely remember, as a young one,Purico, silverswan soy sauce on hot rice—sometimes with fresh eggs—LUNCH! Hi MM, next time try this recipe, good for your cholesterol. Deep fried 1 cup of oatmeal (not the instant) till golden brown. Drain and set aside. junb, o kindred spirit, I’ve been searching and searching for this cereal prawn ‘mix’! If you know a good source or recipe, please do tell? Perhaps makers of chicharon will have tons of lard to sell. frying in lard – just like what Max’s do with their chicken. malinamnam. a little transfat during special occasions is fine.’wag araw-araw. from what i have heard, one of the secrets behind the tasty chicken of the largest(?) local chicken fastfood joint is that they simply deepfry their chicken in pork lard. Slit the prawns at the back and remove the black vein. 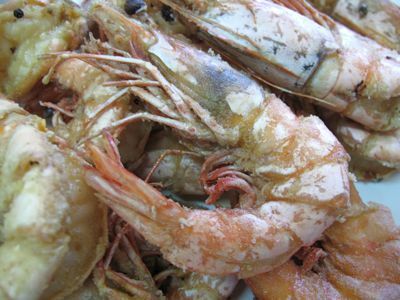 Pat dry the prawns sprinkle a bit of tapioca flour and deep fry till golden brown. Use lard the way MM do it :). Drain and set aside. On a wok stir fry the chopped shallots and add butter, chilli, curry leaves and oats till it turn crispy and golden brownl. 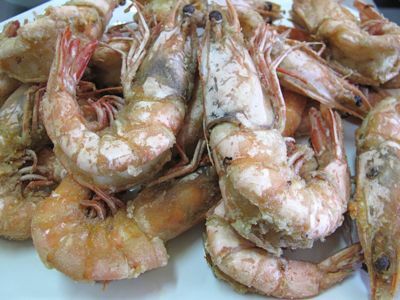 Throw in the fried prawns and mix well season with sugar and salt. 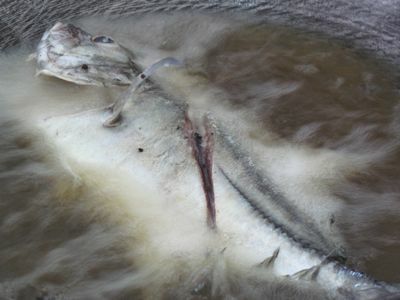 My relatives in Mauban Quezon always cook their left over “catched” mackerel –	in a palayok with fresh kamias and coconut vinegar. 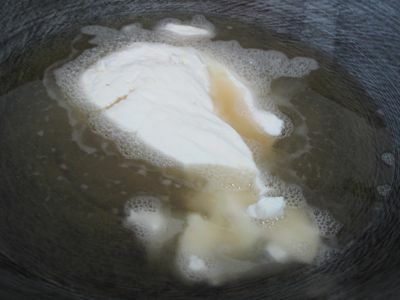 No stirring but slow simmer and constant addition of vinegar – result in a soft but intact “ginanga”ng galunggong”. This is done wth fresh dilis too. Now – – this is eaten with – – solid salted home rendered Lard! and they are great for breakfast, lunch, and dinner. Ong Kin King is bakers’ heaven! Mimac, I answered your question by email. Ley, I walked by the store for several years (it’s right beside the parking lot we use in the Carbon), and only looked in yesterday! Can our local lard be used for pie crusts? @Candygirl Do you mean the pork skin ( chicharon) pounded. That willy be an interesting concept. Hi MM. I stand corrected for my comment on transfat in lard. I’d still go easy ( hinay- hinay) on it. Btw, luv your blogs on local palengkes. Hi MM. Would you know how lard is called in Filipino? Will ask my suki from Guadalupe Market where I can get them. Thanks! MM, what do you do with the lard after frying fish in it? It seems such a waste to just throw it away. Also, how do you dispose of it? I would imagine pouring it down the drain would be a no-no. Seriously, how low can we go?? ?